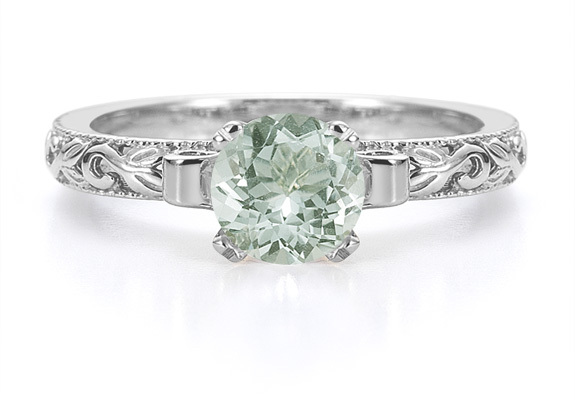 A stunning 6mm 1 carat green amethyst ring is the center of the attention in this Art-Deco inspired ring made in .925 sterling silver from Apples of Gold Jewelry. Also available in 14k white gold or two-tone gold shown below. The green amethyst gemstone is AA rated and setting height of the ring is approx. 8mm with a 2mm wide band. We guarantee our 1 Carat Green Amethyst Art Deco Ring in Sterling Silver to be high quality, authentic jewelry, as described above.